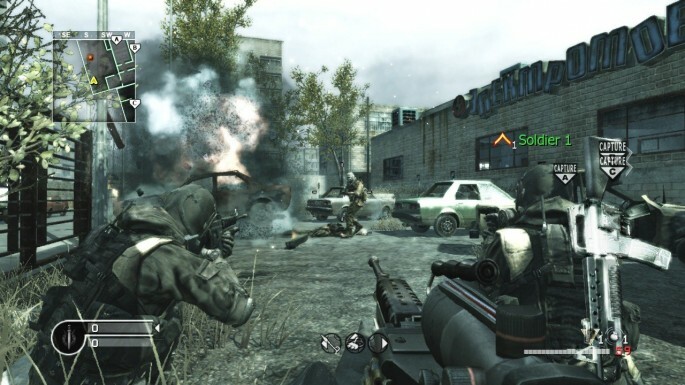 When Infinity Ward released Call of Duty 4: Modern Warfare back in late 2007, nobody expected the title to explode onto the gaming scene in the fashion that it did. Not only was the game a huge success in terms of sales, but critically it has been hailed as one of the greatest FPS titles of all time. The question is, did this title really deserve its success or was it all just hype? Call of Duty 4’s single player campaign puts you in control of a variety of personnel, ranging from the USMC to Seal Team 6. The story begins with you playing as a member of the SAS as you infiltrate a cargo ship. While on the cargo ship, the team finds a nuclear device, which begins the long hunt to find and stop the terrorist threat that seeks to end the western world. While the plot is simple, the addition of several perspectives and side events makes the single player campaign downright confusing. However, the action that fans have come to expect from Call of Duty is definitely integrated into Call of Duty 4, so while the story might not sell the game, the sheer action and gameplay is enough to justify several playthroughs. If the Call of Duty series is known for anything, it’s the gameplay, and Call of Duty 4 is no different. Controls are as smooth as any ever seen in a first-person shooter, and many hail the game as the next-generation Counter-Strike. The controls are pretty straightforward and feature the ability to crouch, go prone, throw grenades, and hold 2 weapons. The ability to customize the button layout on the PlayStation 3 controller means that those who prefer a different style of control will find satisfaction without having to adapt to a forced control scheme. Zooming in with a sniper rifle and assassinating a target has never been so gratifying in a first-person shooter, and the melding of both the presentation and controls make for an outstanding experience. Graphically, Call of Duty isn’t a groundbreaking achievement, but it is still a great game to look at. Character models and animation are both terrific and make for realistic sequences which can be seen throughout the game. The environments in both the single and multiplayer are diverse and equally well-polished. Although environmental textures are low-resolution and noticeably worse than the character models, the attention to detail and color help smooth over the texture quality. The presentation as a whole is truly outstanding, not only with regard to the menus and UI display, but also in the way the story’s narrative is displayed. As a whole, the quality and variety of Call of Duty 4’s visuals are a truly remarkable feat.